Archy is an assistant for Archaeologists that want information at their finger tips. 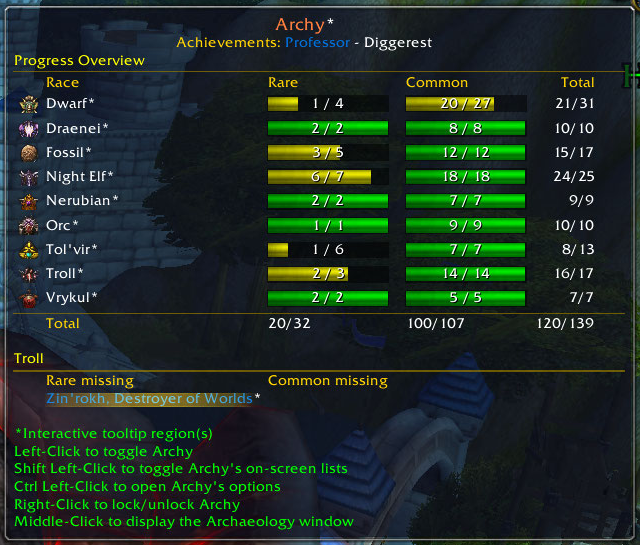 Extra LDB Tooltip mode showing missing rare artifacts per race and overall archaeology progress. responses to tickets will always be faster than posting comments. Users upgrading from v1.8.11 or earlier need to fully exit the game and restart, a simple reload won't work as there's been new files added. I'm not updating this thing anymore. There are commit notes in the file itself. - Fix for ticket 475: Continents can have more than 4 digsites when using the site randomizers. - Add a better visual cue when crate button activates. - User option for showing/hiding Archy frames. - update .toc, compatible with WoW 5.3 "Escalation"
- Auto-hide Archy frames during pet battles. - Updated Libs, western locales mostly done, east/asian pending. - Cleanup/fix for the override button. - Removed broken MBF (Minimap Button Frame) support. The fact that it was even added to begin with seems highly misguided. - Omit the line in the tooltip with the continent name if continent_name is nil. - Fix error when solve is made possible from picking up crated fragments instead of from digging. - Ticket 443, fix error when LDB tooltip is disabled from an LDB panel config. - Ticket 439, 0 length tooltip bars should hide, thanks to Corwin_MacGregor for patch. - LDB Tooltip is now much smaller when Archy is hidden (only shows header and usage tips). - Unintended global from copy-paste. - Various improvements to the distance indicator and associated buttons. -- Only show the faded distance indicator bubble for dragging when frames are unlocked and either survey or crate button shown. -- Reset the distance indicator display after a successful dig when it's faded. - Shorten the help message for trying to toggle Archy Onscreen Displays while in stealth mode. -- Only show it once per session to avoid spamming users purposely hiding Archy Lists and using left-click to turn on/off the waypoints and distance indicator/buttons. - Our Crate button is now smarter when interacting with a Merchant. - We need a couple new phrases localized before tagging a release. - Add an option to hide the new Crate button, same as the Survey one has. - Our Survey button now looks like... a Survey button? 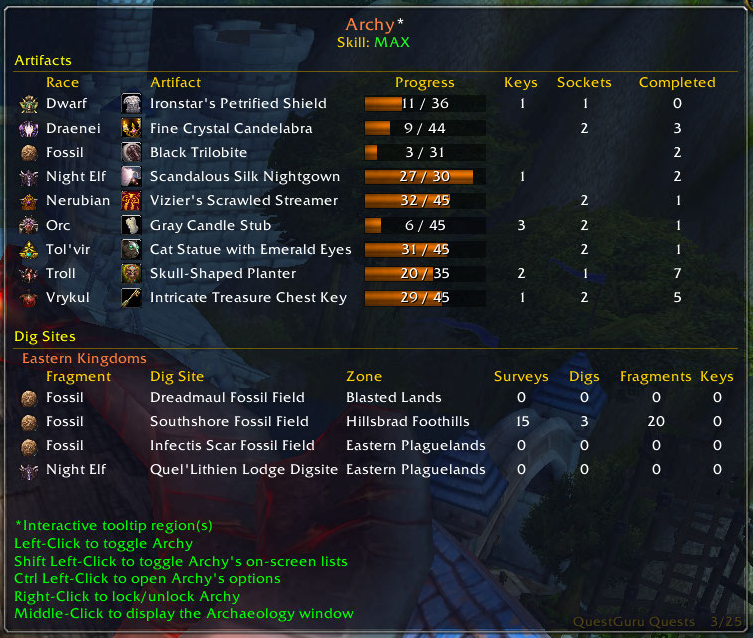 - Archy will now inform the user if they try to show the artifact and digsite lists while in stealth mode. - Improvements to the crate artifacts button. - Add a tooltip showing the artifact or crate loaded in the button. - Make it also work for opening 'Crate of <race> Archaeology fragments'. - Fix Artifact crating button stalling after first artifact. - Fix error related to latest feature on chars without Archaeology. - Add a button for putting artifacts in a crate instead of looking through the bags to use them individually. - Fix (hopefully) tickets #418,427, entering combat while easy-casting survey. - Fix green background when selecting "None" as background or border texture. - First WoW 5.0.4/MoP beta release version, should work on all language clients now. - Repackage to pickup updated Localization data for DigSites and Artifacts. - Make it so any missing or bugged (Hello 'Marco's Test POI') are only reported once per session. - Change the way we calculate MAX_ARCHAEOLOGY_RANK so that it's always in line with the expansion available to the player. - Solves the issue with Archy showing prompts to visit a trainer while at 525 in pre-MoP patch. - Issue is fixed for any accounts that haven't bought a previous expansion as well. - Fix number of surveys per digsite for minimal style; add a variable for easier updates in the future. - Add the ability to toggle the world map from digsite frame for minimal style as well. - - Digsites offline db update, thanks to sidji (http://www.wowace.com/profiles/sidji/) for most the data. - MoP RC (build 16016) updates Known issues: continent filter not working (Astrolabe problem?) Not tested on PTR, keep alpha until the patch rolls out and proper testing is possible. - Changed the LibSink short name for toasts from L["Toast"] to "Archy_Toast" to avoid LibSink collisions. - Keystone details filled in when the server returns item information if it wasn't available on first request. - Add an extra option ("Ignore") to the warning for incompatible tomtom setting that dismisses it for the current Archy version even if you keep the problematic setting. - Pull in updated LibBabble-DigSites-3.0 to fix ticket 387, dig site error on French client. - Add a cooldown display to Archy's Survey Button. - Only warn once per session if an incompatible TomTom setting is detected. - Fix so overal progression and solved counts remain consistent. - Some more internal changes, nothing visible for users. - Use a barfill background for rare and common artifacts progress tooltip. - Some internal changes, no visible changes for users. - Detect and offer to reset incompatible TomTom setting (workaround for ticket #384 until it can be fixed properly). - Improve frame initialization. The distance indicator and survey button should now always show if Archy lists were visible on last logout / reload. - Additionally the site distances will not show as '999999' until the player moves after a reload or fresh logon. - Code cleanup: remove duplicate function that wasn't being called anywhere. - Improve the interaction between LDB tooltip and combat status. - Ticket 382: It is now possible to change / copy / reset profiles when the source and destination profile have different frame styles "Graphical" vs "Minimal". An automatic /reloadui will happen if needed to spawn the respective secure frames. - Ticket 383: Modify the map data caching a little to correct an elusive digsite list initialization error. - Stop the artifact and digsite frames from 'snapping' randomly back to their initial location when the user drags them to re-arrange on screen. - Ticket 380: Prevent and try to correct corrupted dig site stats saved variables. - Keep the distance indicator from completely disappearing when the survey button is visible and undocked so users can find the anchor to move it around. - Prevent taint from moving the survey button in combat. - Prevent taint from changing some Archy configuration options in combat as well. - Update the digsite cache when users toggle the 'filter by continent' option on the tooltip so it can refresh 'on the fly' and show all continent data without a reload. - Audio and text alerts not firing for subsequent solves of the same common artifact after the first time it's solved during a game session. - "Mummified Monkey Paw" rare Tolvir project not getting counted as solved in overall progress LDB tooltip. - Audio and text alerts not working when 'include keystones' option is selected and there's enough keystones to solve in the player's inventory. 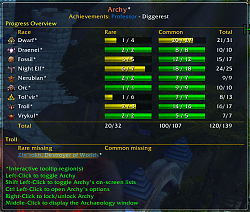 - Archy digsite and artifact lists initialization when logging or reloading in combat. 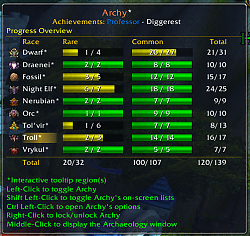 - Add a line with cumulative rares/common artifacts solved across all races to the archaeology overview LDB tooltip. - Change Archy caching of map data to after PLAYER_ENTERING_WORLD to possibly prevent a conflict with BigWigs module enable. - Improve easy cast survey (double-right-click to survey). Temporarily suspend 'click to move' when Archy is shown if it was enabled, restore it when hiding Archy. - Improve battlefield mini map digsite blobs. No longer necessary to toggle Archy if the mini map wasn't visible. - Add an option to prevent Archy automating the display of digsites on worldmap/battlefield map and minimap tracking. - Additional LDB tooltip mode: Overall Archaeology progress; click the Archy tooltip header to alternate. -- Added a hint on LDB tooltip for interactive (clickable) regions. -- Added an artifact database (current for 4.3.2) and artifact name localization through LibBabble-Artifacts-3.0. -- When showing the Overal progress tooltip click a race name to show the rares missing for that race. -- Click on an artifact name from the missing list to get the project spell link. - Toggle minimap digsite tracking, worldmap and battlefield mini map digsite blobs alongside Archy; use '/archy stealth' or shift-click LDB if you want to hide onscreen lists but keep Archy active and blobs showing. - Don't update the skill bar if the toon doesn't have Archaeology. - Re-add digsite tracking on battlefield mini map when Archy is active. - Do not easy-cast survey if the player has a fishing pole equipped to avoid breaking fishing addons. - Better handling of combat status for easy-cast. - Middle click on LDB/minimap icon can be used to toggle the Archaeology UI instead of only to show it. - 'dig sites frame gone missing'; this would happen if the player logged on after having toggled 'show digsites' off from the world map in the previous session. - 'error on logon' for ptBR game client; in the process pulling in updated LibBabble-DigSites-3.0 ptBR translations by Jizar and Sapolau. - Play 'ready to solve' sound and/or announce once per artifact for the session instead of once per race. - Delay loading ArchaeologyUI to solve an issue with missing race icons on Blizzard Archaeology frame. - Add the missing tooltip hint for opening Archy options from the minimap icon/LDB. 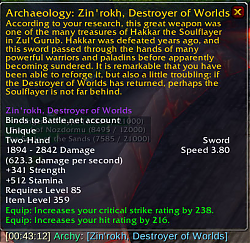 - Error when Archy is enabled on a character that doesn't have the Archaeology profession. - Archy using keystones for solving regardless of user selection. - keystone adjustment text eg. (+12) on artifact details and solve button behaviour is now consistent with number of keystones placed in socket by user. - Artifact list not updating to new artifact after solving. - Improve combat detection when loading/reloading in combat. * Added support for Brazilian Portuguese. * Fixed issues with resetting the GUI position. * Fixed issues with logging in or reloading the UI while in combat. * Properly update the races frame after completing an artifact. * Removed all map blob-drawing code and config options, as this is now handled by the WoW client as of 4.3. * Miscellaneous fixes and cleanup. * Added missing localization phrase. Bah. * Fixed artifact solving with keystones. * Added toast output, which is now the default announcement output. * New configuration section: Tooltips. * New configuration option: Tooltip scale. * Tooltip will now only show out of combat. * Hopefully fixed the bug with solving via keystones. * Fixed Lua error that would sometimes occur when using Survey. * Corrected the announcement of solvable artifacts and keystones. * Normalized behavior of artifact solving. * The LDB tooltip is now scrollable again. * Plugged some small memory leaks. * A plethora of changes, bugfixes, and memory optimizations. Archy will no longer chew RAM and thereby CPU when freeing said chewed RAM. * Changed the default progress bar color to a grayish white. * New UI for both dig site list and artifact list. Some of the artifact list UI was inspired by Minimal Archaeology. * Survey Distance Indicator has been given a skin and is docked to the Dig Site list by default. You can undock it from the Dig Site list and move it around. * To help combat the dig site boundaries exceed past the minimap, an arrival distance option has been implemented. This will hide the dig site boundaries until you are 400 (by default and changeable) yards away from the dig site center. * Archy should now play nice with other addons such as Deadly Boss Mods, TukUI, LUIv3, etc. * Localization for Traditional Chinese has been added - Thanks digmouse! * Fixed a bug that caused a lua error when changing zones. * You can now shift-left click the minimap (ldb) icon to toggle the on-screen lists visibility. * Filtering of the Current Artifact Research on-screen list for races specific to the continent you are on is now available in the Interface Options panel. 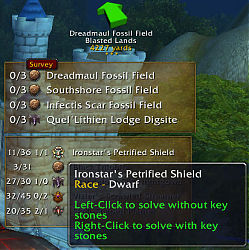 * An option to play a sound when you have enough fragments and/or keystones to solve an artifact is now available in the Interface Options panel. * Easy access to the TomTom waypoint arrival distance and sound trigger options are now available in the Interface Options panel. * Digsites on the current digsite list can be "blacklisted"
Take your time building Archy the way you need to. Been using this since day one. Thank you for your willingness to do this. 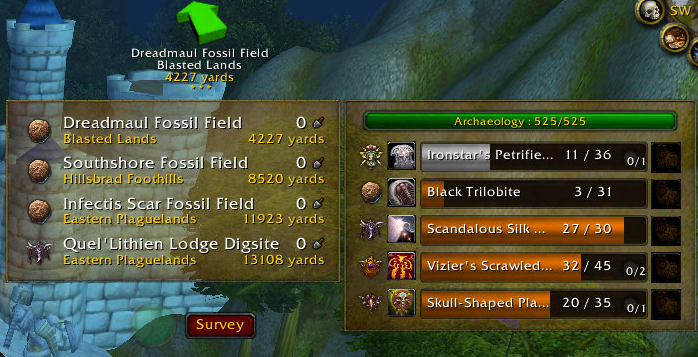 Archy has been my goto since archaeology was implemented in game. Is there anything that we users can help you with, other than not bugging you while you find the time to do this? 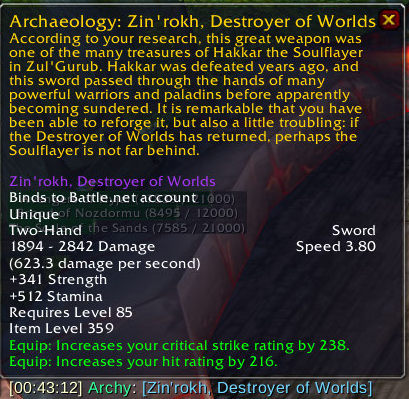 And do you have another addon for archaeology that you would be willing to recommend for use while we wait for Archy to come back? Unfortunately, this isn't a simple fix. Blizzard completely replaced the map system/API, so everything map-related has to be rethought and rewritten. I'm going to be rewriting Archy in its entirety, instead of trying to patch all of this in, to save my sanity and finally get the cleanups I'd been wanting to do for some time now. The second error is due to the first error. All fixed, now. I've been having issues with getting my installation running again, so just getting around to posting this. Received this error on login. I'm leaving my list of addons in place, in case they're relevant. I'd like to add my voice to anyone else asking for the addon to be updated here as well. There's been recent activity on Curse, but I strongly prefer to use WoWInterface. Torhal is usually good about updating here. I wasn't watching for this on Curse, as it's more a QoL addon than a Needed to Function addon. Note: I sat there idle, farming out the errors on to comments, and then opened my naval table, and my garrison table, in that order. When I moved away from there (which I did without closing the mission window, since distance closes it), I got this error. I've deleted the list of addons. Last edited by Barleduq : 07-20-16 at 08:24 PM. Getting the following with todays 7.0.1 patch. Nothing seems to work with it right now. Ace3 was updated already. Hi, is there any way to disable the message about incompatability with Tomtom? Each login, I get a message saying "enable automatic quest objective waypoints" will cause archy to lose control etc etc. I'm aware of this, but can I turn this message off somehow? Previous versions had a once-per-session option to ignore the fact that TomTom's auto-point-to-quest option would clobber Archy's auto-point-to-nearest-digsite option. I changed that to "Either use one or the other, end of story" because it seems pointless to click ignore every time you log in and have TomTom and Archy continually fight with one another about where the crazy arrow will be pointing, when you could simply go into Archy's config options and disable the TomTom integration or go into TomTom's options and disable the auto-point-to-quest option. If you have another scenario that I didn't take into account, I can look at changing the behavior again.